In many ways, America remains two societies – one black and one white – as measured by key demographic indicators of social and economic well-being. 5 At the same time, it’s important to note that on some measures, gaps across racial and ethnic groups have diminished. Analyses of federal government data by the Pew Research Center find that blacks on average are at least twice as likely as whites to be poor or to be unemployed. Households headed by a black person earn on average little more than half of what the average white households earns. 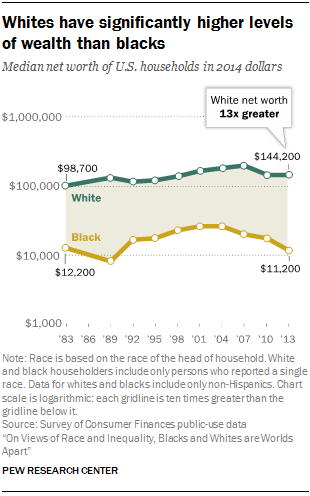 And in terms of their median net worth, white households are about 13 times as wealthy as black households – a gap that has grown wider since the Great Recession. Racial differences in family structure have persisted as well. While marriage rates are falling among all racial groups, the decline has been most dramatic among blacks. Non-marital births are more than twice as common among black mothers as white mothers, and black children are almost three times as likely as white children to be living with a single parent. To be sure, some economic and educational differences between blacks and whites have narrowed over time. While blacks are more than twice as likely as whites to be living in poverty, this actually reflects a marked improvement since the mid-1970s when blacks were almost four times as likely as whites to be poor. And the white-black gap in high school completion rates has almost disappeared since the 1960s, though blacks are still significantly less likely than whites to graduate from college. While education is widely viewed as the key to upward mobility for all races, the Pew Research Center analysis finds that the benefits of schooling often flow in unequal measure to blacks relative to whites. For example, among those with a bachelor’s degree, blacks earn significantly less than whites ($82,300 for black householders vs. $106,600 for whites). In fact, the income of blacks at all levels of educational attainment lags behind that of their white counterparts. Similar racial disparities across educational levels occur across measures of social well-being and family structure. For example, about nine-in-ten (92%) white women with a bachelor’s degree who recently gave birth were married, a proportion that drops to 60% among new black mothers with a similar level of education. Taken together, these findings suggest that educational differences alone cannot fully explain the black-white gaps in economic outcomes or family structure. The remainder of this chapter explores major differences in social and economic well-being across racial and ethnic groups, with particular focus on the persistence in the disparities between blacks and whites in recent decades. The first section examines in greater depth racial differences in educational attainment. Later sections explore various economic outcomes, including measures of family income, wealth and homeownership, poverty and unemployment. The chapter concludes with sections on racial differences in family structure, including non-marital birth rates, child living arrangements and marriage rates. Increasingly, a college degree is the key to financial well-being, while the value of a high school diploma has diminished markedly over time. Since the 1960s, rates of college graduation have increased significantly for all major racial and ethnic groups, though large gaps persist. 6 Whites are far more likely to hold a bachelor’s degree than blacks. More than a third (36%) of whites ages 25 and older do, compared with 23% of blacks, according to analyses of the Current Population Survey. As college completion rates have been on the rise, the white-black gap in college completion has narrowed somewhat – while in 1995, whites were almost twice as likely as blacks to have a bachelor’s degree, whites today are about 1.5 times as likely as blacks to have one. Whites are also slightly more likely than blacks to have completed high school. However, the black-white gap in high school completion has narrowed substantially over the past half century, driven in part by dramatic increases in high school completion for blacks. 7 In 1964, just 27% of blacks ages 25 and older had a high school diploma, while today the share is 88%. By comparison, 51% of whites in 1964 had a diploma, versus 93% today. Among Hispanics, the share with a bachelor’s degree has tripled since 1971, when data for this group first became available. Now about 15% are college graduates. Even so, the Hispanic-white gap in college completion has persisted; whites today are more than twice as likely as Hispanics to have a college degree, as was the case in the early 1970s. Hispanic high school completion rates have roughly doubled since the early 1970s, yet a white-Hispanic gap persists in this measure, too. Today, two-thirds of Hispanics have a high school diploma, compared with about nine-in-ten whites (93%). The story is very different for Asians in the U.S. They have consistently been more likely than other racial and ethnic groups to have a bachelor’s degree. Today, just over half (53%) do, compared with about 36% of whites. And when it comes to high school completion, Asian rates have more or less been on par with whites since 1988, when data on Asians first became available. Household heads with higher levels of formal education tend to have higher household incomes. However, the black-white gap in income occurs across all educational levels. For example, the median adjusted household income among black householders with at least a bachelor’s degree was $82,300 in 2014, while the income of college-educated white householders was $106,600. The median adjusted income for households headed by Hispanics in 2014 was about the same as that of households headed by blacks – $43,300. The income gap between Hispanics and whites has also persisted over the past four decades; Hispanic median household income ($34,000) was 67% that of whites in 1970, the first year that data were available for Hispanics. 10 By 2014, it was 61% of white household income. 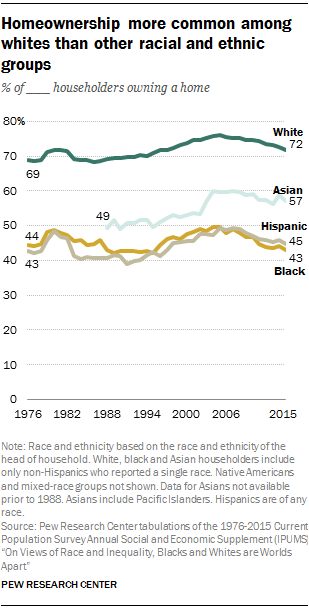 Conversely, the gap between Hispanics and blacks has narrowed. In 1970, Hispanic household income was about 20% higher than that of blacks, but that gap has more or less disappeared over the past two decades. 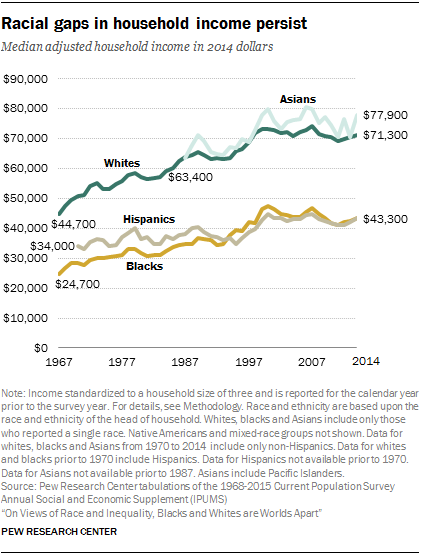 As with white incomes, the incomes of households headed by Asians exceeded $70,000 annually in 2014. Asian income has been on a par with or has exceeded white income since 1987 when comparable data for Asians became available. Blacks are more than twice as likely as whites to live in poverty. 11 In 2014, about a quarter (26%) of blacks were poor, compared with 10% of whites. The black-white poverty gap has narrowed somewhat since the mid-1970s, when 30% of blacks were living below the poverty line – a proportion nearly four times the share of whites living in poverty (8%). Hispanics, too, were more than twice as likely as whites to be living in poverty in 2014 – 24% were. While Hispanic poverty has fluctuated over the years, today’s rate is similar to what it was in 1974 (23%). In 2014, the Asian poverty rate (12%) was just slightly higher than that of whites. This marks a narrowing of the white-Asian gap, driven primarily by the declining share of Asians who are poor. In 1987 (the first year that poverty data regarding Asians are available), 16% of Asians were living in poverty, compared with 9% of whites. The wealth gap between black and white households has widened since 1983, when the median wealth of white households ($98,700) was eight times that of the wealth of black households ($12,200). The gap narrowed in the 1990s and early 2000s but increased in the years following the Great Recession. While median net worth tends to increase as levels of educational attainment rise, the white-black gap in wealth persists even controlling for educational differences. For example, the median net worth of black households headed by someone with at least a bachelor’s degree was $26,300 in 2013, while for households headed by white college degree holders that net worth was $301,300 – 11 times that of blacks. The wealth gap between white and Hispanic households has been consistently large. In 2013, the net worth of white households was roughly 10 times that of households headed by a Hispanic ($14,000). In comparison, in 1983, the wealth of white households was about 11 times that of Hispanic households ($9,000). The racial and ethnic differences in median net worth are driven in part by differences in homeownership. White householders have consistently higher rates of homeownership than racial and ethnic minorities. For instance, 72% of white householders own their own home, compared with 43% of black householders. As is the case with household wealth, the white-black gap in homeownership is also widening somewhat; in 1976, the homeownership rate among blacks was 44% vs. 69% for whites. Homeownership rates generally rise for blacks and whites who have higher incomes and more education, but the differences between black and white households persist. The homeownership rate of upper-income blacks (68%) is significantly lower than the rate of upper-income whites (84%). 14 The same is true among the highly educated – 58% of black householders with a college degree own their home, compared with 76% of whites. The Hispanic-white gap in homeownership has fluctuated since 1976, with the widest gaps occurring in 1991 when the Hispanic rate was 39% and the white rate was 70%. Today, 45% of Hispanic householders are homeowners. While Asians still trail whites in terms of homeownership, that gap has been narrowing. Today 57% of Asian householders are homeowners, while in 1988, when data on Asians first became available, the Asian homeownership rate was 49% vs. 69% among white householders. The unemployment rate for whites was 4.5% in 2015 and among blacks that share was 10.3%. As unemployment rose in the early 1980s due to an economic downturn, the jobless rate for all blacks rose to 21.1% in 1983 – its highest point in more than 50 years – while the white rate peaked at 9.3%. Black men have particularly high unemployment rates. Some 11.6% are unemployed. By comparison, the rate among white men stands at 5.1%. And 9.3% of black women are unemployed, while just 3.8% of white women are. Among Hispanics, unemployment stands at 7.2%, and the Hispanic-white unemployment gap today is similar to what it was in 1971 when data about Hispanics first became available. Then, 8.6% of Hispanics were unemployed – 1.5 times the rate of whites. In 2015, unemployment for Hispanics was 1.6 times that of whites. Just 3.6% of Asians are unemployed today. Asian unemployment has mostly been on par with whites since 1988 when comparable data for Asians was first available. 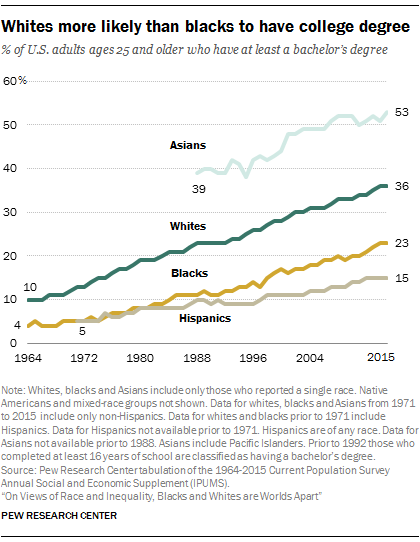 Today Asians are slightly less likely than whites to be unemployed. Non-marital births are far more common among blacks than whites. In 2014, roughly seven-in-ten (71%) births to black women occurred outside of marriage, compared with 29% of births to white women. This gap in non-marital childbearing is a longstanding one. In 1970, fully 38% of all births to black women occurred outside of marriage, compared with just 6% among white women. By 1990, 67% of births to black women were non-marital, versus 17% among white women. Educational differences explain some – but not all – of the racial and ethnic differences in non-marital births; even within educational categories, the racial differences in non-marital births persist. For example, among whites who recently gave birth, 92% of those with a college degree were married in 2014. By comparison, the share among blacks was 60%. Non-marital births have been on the rise for decades in the U.S. While just 5% of all births were to unmarried women in 1960, by 1990 more than one-in-four (28%) of all births were to unmarried women. The number peaked at 41% between 2008 and 2013 and by 2014 it ticked down to 40%. In 2014, just over half (53%) of births to Hispanic women were non-marital births. This marks a significant rise since 1990, the first year for which data regarding Hispanics is available, when 37% of births to Hispanics occurred outside of marriage. Black children are more than twice as likely as white children to be living with just one parent. More than half (54%) of black children did so in 2014, compared with 19% of whites. This 35-percentage point difference marks a widening of the racial gap in children’s living arrangements. In 1970, 35% of black children were living with only one parent, compared with 10% of white children. Throughout the decades, Hispanic children have been more likely than whites, but less likely than blacks, to be living with a single parent. In 1970, 18% did, and by 2014 the share was 29%. While the likelihood of living with a single parent has increased markedly since 1970 for whites, blacks and Hispanics, that is not the case for Asian children. In 1970, one-in-ten were living with only a single parent, and by 2014 that share increased slightly to 13%. 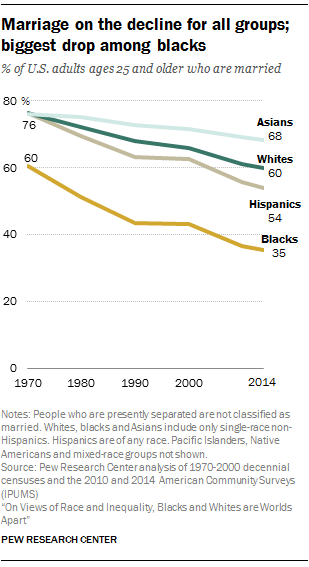 The marriage rate has declined across racial and ethnic groups, but the drop has been particularly dramatic among blacks. In 2014, some 35% of black adults ages 25 and older were married, compared with 60% of whites. In 1970, this gap was considerably smaller: Fully 60% of blacks and 76% of whites were married at that time. Across all groups, the declines in marriage have been driven largely by increasing shares of people who have never married. This is especially common among blacks; more than one-third of those ages 25 and older have never married, compared with just 17% of whites ages 25 and older. Divorce, too, contributes to racial and ethnic differences in the likelihood of being married. Marriages involving black women tend to be less stable than those of whites, Hispanics or Asians. About 56% of first marriages of black women will last until their tenth anniversary, compared with 68% among marriages of white women. Typically more education is linked to higher marriage rates, and the relatively low educational attainment of blacks is one factor underlying the low prevalence of marriage in this group. However, even controlling for education, racial differences persist. For instance, among college graduates, less than half (46%) of blacks were married in 2014, compared with 67% of whites. By comparison, in 2014 some 68% of all Asians ages 25 and older were married, as were just over half (54%) of Hispanics. In 1970, the marriage rates of these groups were similar to that of whites – about three-fourths were married. And these racial and ethnic differences in marriage also are apparent even when looking only at people with college degrees – among those with a four-year college degree, 59% of Hispanics were married, as were 72% of Asians in 2014. Overall, some 27% of Hispanics have never married, as is the case for 19% of Asians. Women from both of these groups experience first marriages that are more likely to endure than those of white women. Among Hispanic women, some 73% of marriages will last until the tenth anniversary, as will 83% of those involving Asian women.